Whenever I put zucchini in a dessert, I suddenly feel guiltless eating it. This Chocolate Zucchini Cake, is practically guiltless. It is also moist, rich, and full of amazing chocolate flavor, that you are going to love. The zucchini really makes this cake so moist and delicious. 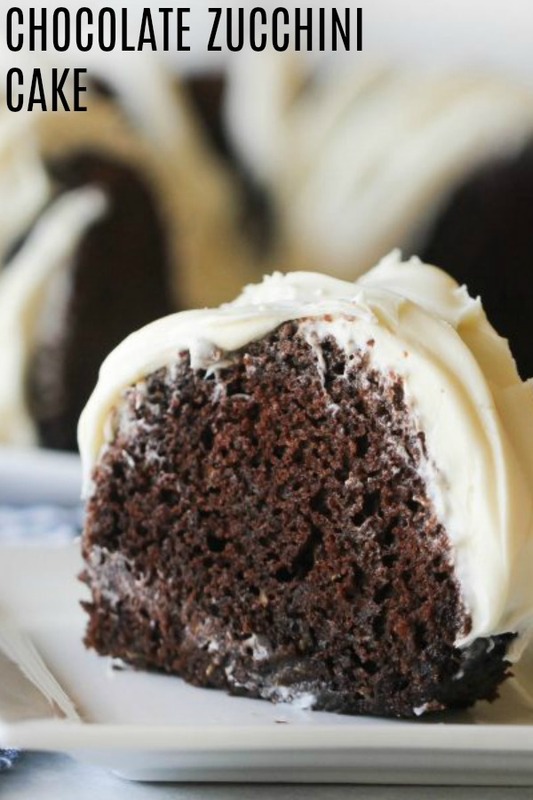 The perfect mix between chocolate cake and zucchini. If you have a lot of zucchini laying around, this is what you need to make. The zucchini in this chocolate cake, really does make it so moist. I decided to put this to the test. I made this Chocolate Zucchini Cake, and a regular chocolate cake. I had my husband close his eyes and eat each one. I kid you not, he said the Chocolate Zucchini Cake was the BEST cake he has ever eaten. He agreed that it was way more moist, and even had a richer flavor. So there you have it, zucchini is the secret ingredient to making a moist and delicious cake. This recipe is so simple, and if you have a lot of zucchini at this time of year, like me, you need to put them to use, and make some of this delicious cake. The recipe calls for this cake to be baked in a bundt pan, however, not everyone has a bundt pan. This recipe could easily by made in a 9×9 inch or 9×13 inch pan, and taste just as good. I would recommend keeping the cooking time the same, but checking on it more frequently. I have personally never made this recipe using a glass baking pan, but I bake all my other cakes in pans, and this batter has the same consistency. When it is done baking, let it completely cool, before spreading on the frosting. You could also keep it in the pan and frost it. 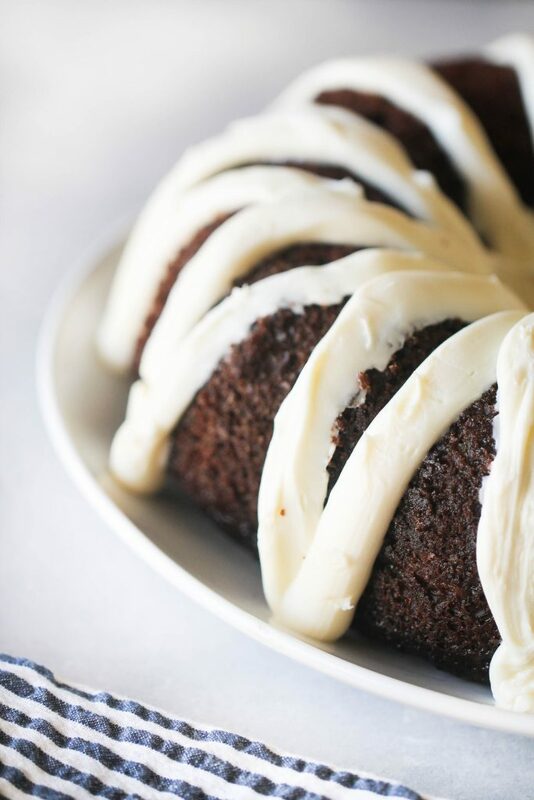 We take the bundt cake out of the pan, but if you are cooking in a rectangle or square pan, we recommend keeping it in the pan and serving from it, to avoid it breaking or crumbling when trying to remove it. I have found the best way to shred zucchini depends on your preference, but I prefer mine extremely thin, that I won’t have zucchini chunks or strands. I have found the best way to do this, is by placing my zucchini (cut into 2 inch chunks) into my food processor, and blending it until I have reached my desired consistency. I wouldn’t blend it until it has become a liquid substance like a smoothie, but just until it isn’t in large chunks. You could also use your potato peeler, or cheese grater, to create small and fine pieces of zucchini, for your cake. have you tried our Zucchini Spaghetti Salad? Each recipe is tried and true, so you know you can trust them. They are all picky eater approved. This Zucchini Spaghetti Salad, is the perfect way to sneak veggies into your kids diets. It is the best salad for bbq’s, potlucks, dinner, etc. To prepare cake, coat a 12-cup bundt pan with cooking spray. Place sugars, cream cheese, and vegetable oil in a large bowl, and beat with a mixer at medium speed until well blended. Add eggs and beat in 1 teaspoon vanilla extract. Combine 2 1/2 cups flour, 1/2 cup of cocoa, baking powder, baking soda, salt, and cinnamon in a medium bowl, stirring well with a whisk. Add flour mixture and buttermilk. Stir in zucchini, and 2/3 cup chocolate chips. Pour batter into prepared pan. Bake at 350° for 1 hour or until a wooden pick inserted in cake comes out clean. Cool in pan 10 minutes on a wire rack; remove from pan. Cool completely on wire rack. Then add your favorite frosting or glaze on top.